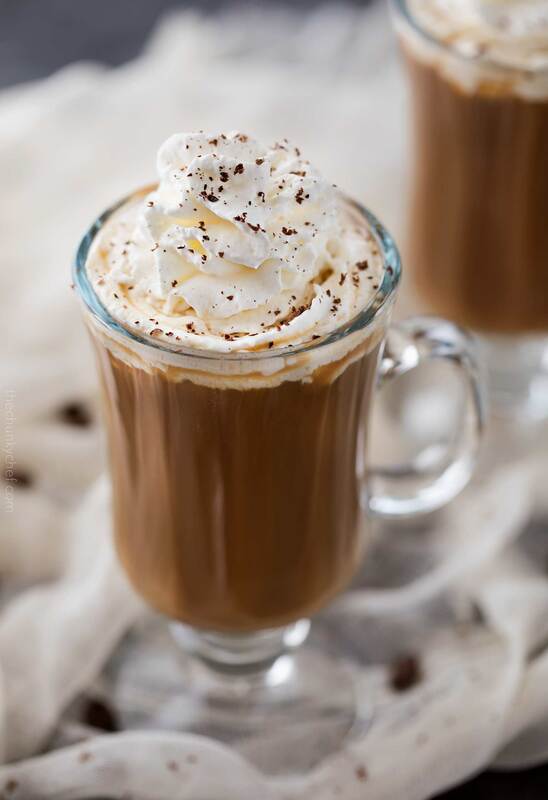 Whether you’re enjoying St. Patrick’s Day, or enjoying an after dinner drink, you need to be sipping this Irish coffee with homemade Baileys whipped cream! 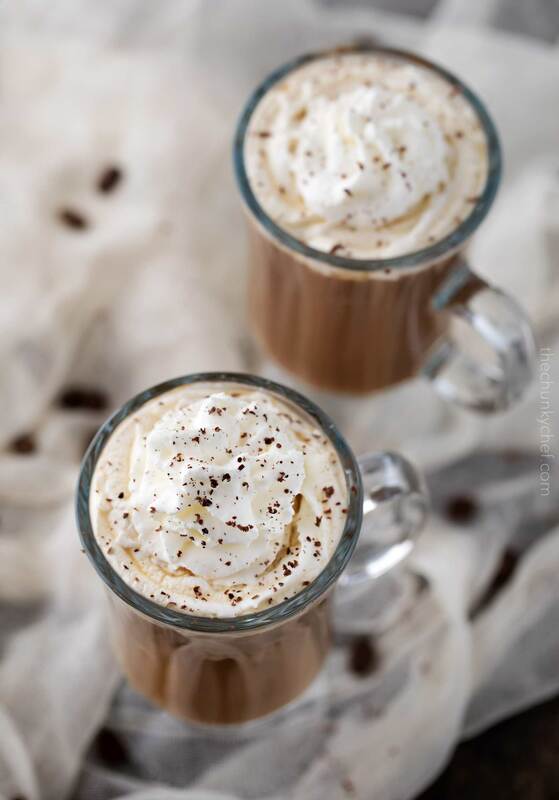 You’ll love how easy it is to make this iconic Irish coffee drink! The optional homemade Baileys whipped cream really sets it apart from the rest! 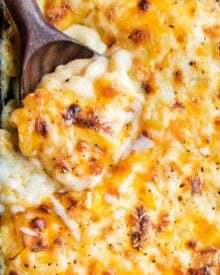 I know, I know… it seems absurd to be sharing a St. Patrick’s Day recipe when Valentine’s Day hasn’t even happened yet… but that’s how us food bloggers have to operate. 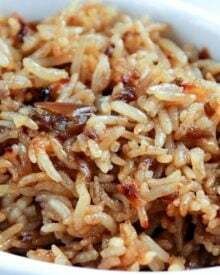 We have to preemptively share holiday recipes a good month or so in advance, so that when the actual holiday rolls around, the posts have had time to gain popularity on social media/search engines. It’s crazy, but I love it! If you’ve been following along on the blog for a while, you might be wondering why I’m posting this Irish coffee recipe here, instead of on my second website, The 5 o’clock Chef. Well, I have some news on that front! I’m going to be dissolving the 5 o’clock Chef and slowly moving recipes over to this site. 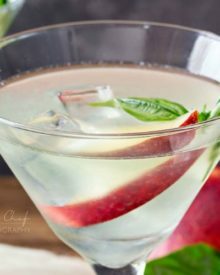 Strategically speaking, a cocktail blog is not all that great for search engine traffic, and long term growth, so I’ve decided to go in a new direction! 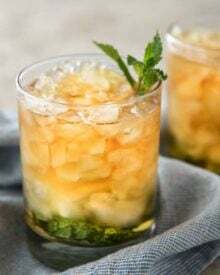 I’ll be sharing the occasional cocktail here from time to time, so you’ll still be seeing some fabulous party drinks. Over there in the sidebar –> you’ll see a logo for the sister site for The Chunky Chef, titled Smart Skinny Recipes. There I’ll be sharing all sorts of healthy recipes… yes, healthy ones! 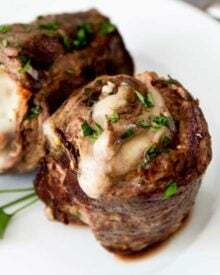 I’ll be calculating the weight watchers smart points for each recipe there, but full nutritional information will be shared as well, in case you’re not doing weight watchers, but rather just eating healthier 🙂 Stop by and check it out!! 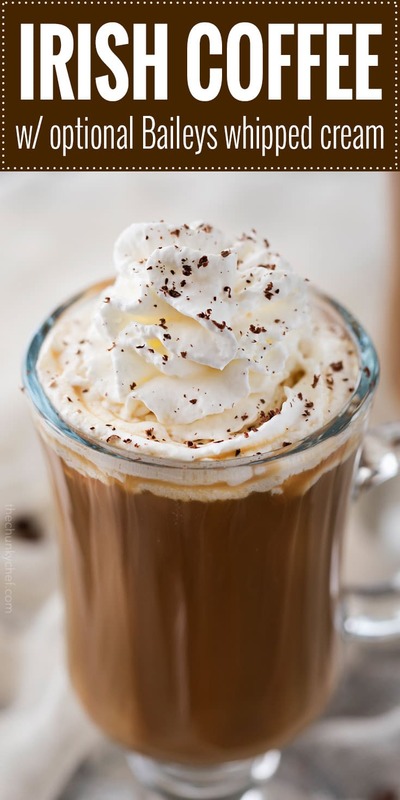 Okay, time to get to this delicious Irish coffee recipe! Have you ever had one? It’s a fabulous holiday or even after dinner kind of drink, and has a wonderful slightly bitter/caramel flavor, with a kick from the whiskey, and the cool, creamy whipped cream on top. 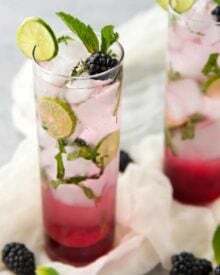 It can be a deceiving drink, because so many drinks nowadays are SO sweet, and this one isn’t. It has some sweetness, yes, but not too much, and it can take people by surprise if they aren’t expecting it. Of course, this is YOUR Irish coffee, so if you prefer a sweeter version, go ahead and add some extra sugar. WHAT KIND OF WHISKEY IS BEST FOR AN IRISH COFFEE? My personal favorite is the classic, Jameson’s. It’s readily available at any liquor store, and is truly the classic Irish whiskey. Other alternatives would be Teeling or Bushmills Black Bush. Fill your mugs with hot water first. From time to time, hot liquid (like coffee) being poured into a glass mug can cause it to crack. Filling it with warm/hot water and letting it sit will help prevent that. Odds are, you won’t have an issue, as this happens more with older and thinner glass mugs, but better safe than sorry! Plus, pre-warming your mugs will help keep the Irish coffee hot a little longer. Use strong coffee… that you like! It seems obvious, but you definitely want to use a brand of coffee that you truly enjoy. This isn’t the time for that bargain instant coffee from the back of your cabinet… trust me. 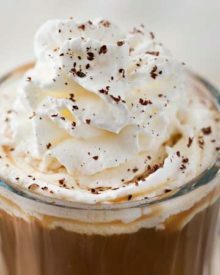 If you don’t have the time or energy to make your own whipped cream, redi-whip works well too (although it won’t have the extra Baileys flavor). I topped my drinks here with some grated chocolate, but that’s 100% optional. Having an Irish St. Patrick’s Day feast? This is the perfect drink to serve afterwards!! Irish Coffee Mugs – the classic glass mug, in a nice 4 pc set. I use these for hot chocolate too! Strong coffee – this is the brand we love! 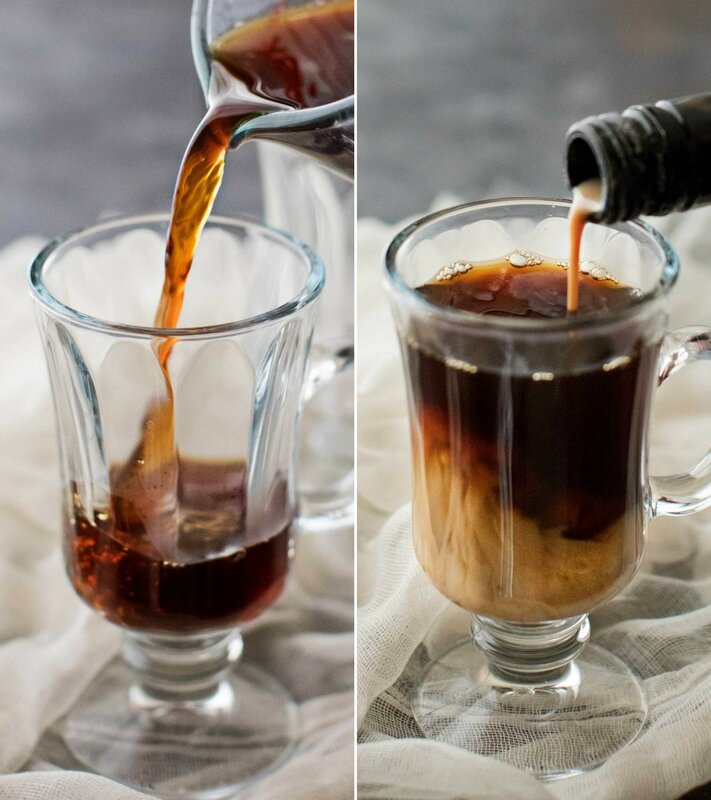 WANT TO TRY THIS IRISH COFFEE? PIN IT TO YOUR HOLIDAY OR DRINKS BOARD TO SAVE FOR LATER! 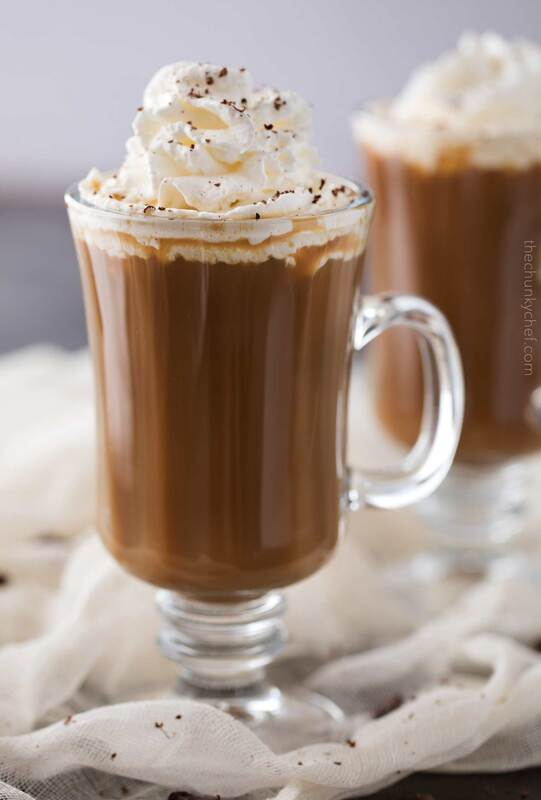 Whether you're enjoying St. Patrick's Day, or enjoying an after dinner drink, you need to be sipping this Irish coffee with homemade Baileys whipped cream! Fill two mugs with hot water and let stand 1-2 minutes. Dump out water and fill mugs with 6 oz each of hot coffee. Stir in 1 1/2 oz whiskey in each mug, and 1-3 tsp brown sugar in each mug, until sugar is dissolved. Pour half of Irish cream into each mug and stir to combine. Add whipping cream and Baileys to a chilled bowl. Beat with a handheld mixer for 1-2 minutes, until desired consistency is achieved. For a loose, frothy layer of cream, beat until whipping cream is frothy and spoonable. For stiffer whipped cream, beat until cream has medium to stiff peaks forming. 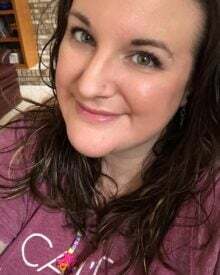 These are some great tips, Amanda! I can’t wait until the weekend to try this out – just going to have to take it regular for now;) Your pictures are always so beautiful! This is such a great way to end dinner! That whipped topping sounds fantastic! Congrats on the new site too!! Wishing I had a glass right now to start my day. YES, please!! Irish coffee is my favorite!! This looks fantastic!! Such a perfect coffee after dinner! Love this! Now this is a treat I can get excited about! I don’t know what I am more excited about… the coffee or that whipped cream!!! This is the perfect morning drink. 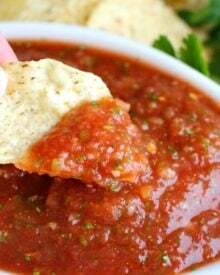 I need to make some tomorrow.